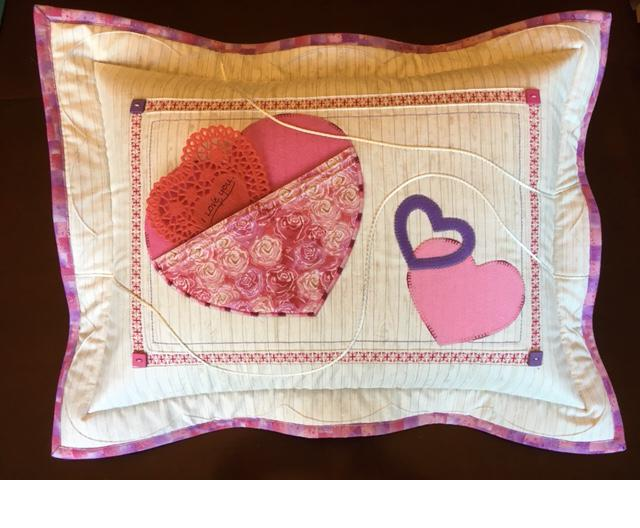 Make a fun Valentines’ Day pillow to give to your sweetheart, child, grandchild, an elder or friend! This class will focus on learning about pin tucks, applique, decorative stitching, installing an invisible zipper, couching and sewing on buttons ….. all with available Bernina feet! You will find that these feet are indispensable for all kinds of sewing: apparel, quilts, crafts and more! The pillow has a pocket for tucking in those special Valentines (note red doily in photo)! Follow along with instructor, or create your own Valentine collage while learning!